After enjoying a restful night’s sleep at the Country Inn & Suites, Woodbury, MN, follow the aroma of fresh coffee and French toast to the hotel’s dining room for the complimentary, hot breakfast. Grab a plate and pile it high with traditional breakfast favorites like pastries and biscuits with gravy. 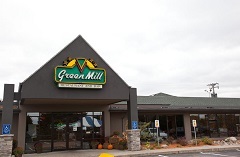 As you make plans for the day, don’t forget to include a visit to Green Mill Restaurant & Bar for lunch or dinner. The continental breakfast is the best I have had at any hotel so far. The person who worked in the breakfast area was a delight. She was always asking if she could do anything for us, and she kept everything well stocked and clean. For lunch or dinner, stop by the Green Mill Restaurant & Bar to enjoy a friendly, casual atmosphere and classic American dishes like wings and burgers.